The Grade I listing text states that the nave's North and West walls, and possibly part of the South wall date from before 1066, but Mike Salter in his The Old Parish Churches of Cumbria, dates these portions of the church to the 12th century. The tower dates from the 12th century and contains a good set of draw bar slots on the doorway into the nave. Above. View of the 12th century tower from the church yard. Above. Carved tympana in the doorway of the tower\Nave. The tympana shown above, are probably pre-conquest, and were discovered and set in their current position during the 19th century rebuild of the church. I originally missed this carving due to the darkness of the tower. Only afterwards did I realise that I'd managed to photograph it. See this link for more photos of these Norman carvings. Above. Draw bar slot and rebates in the tower\Nave doorway. There is also a set of heavy iron hinges on the wall within the tower indicating that there would have been a door separating the Nave from the tower at some point. For the draw bar slots to have been any use, there must have been a door within the thickness of the wall, but there are now no signs or remains of hinges. It's therefore obvious that the tower at Long Marton was designed to be a safe or secure location, but most likely, as Philip Davis has pointed out to me in the past, as security rather than defence. There are no signs of fireplaces on any of the floors of the tower, indicating that it was not designed as a place of refuge or as somewhere to live, though I was unable to gain access to the first floor of the tower. 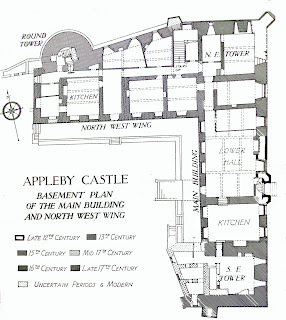 The staircase to this level is a later addition, as shown on Mike Salter's plans, and leads to the wooden gallery that looks out over the Nave towards the Chancel. Philp Davis interestingly points out that churches may have been permanently occupied, so there may have been instances where the church doors needed to be locked to prevent entry whilst business or services were conducted in private, or so that no one could 'sneak' in unnoticed to steal valuables. I very nearly didn't bother trying to find this site....all the indications were that the moat was ploughed out and not visible any longer, and that the hall is mostly a modern building. Luckily I checked it out, and was rewarded with a very well defined part of one of the wet moats that would have surrounded the hall, and a very pleasing building next to it, still showing the Pickering's family crest above the front door. Above. The South Western part of the moat. The moat, which now measures 75 meters North to South, and 31 meters West to East, is but a shadow of its former self, but what remains is quite well defined and still has water flowing through it fed by what looks like a spring at the head of the field. The moat flows out into Lyvennet Beck, which may have acted as a secondary we moat when the hall was fully occupied as the home of the Threlkeld family in the 1300s. The moat is only about a foot deep, and has probably silted up over the years....it's a surprise therefore that it's survived at all. The moat is only half the story here though, as there was also a tower hall. In 1304, the hall and its estates were held by the Threlkeld family, specifically Henry de Threlkeld. There was a free standing solar tower, probably built in the 14th century, which was remodelled by the Pickering family sometime around 1550. Unfortunately for us though, the tower was demolished in 1750. Above. The lower part of the moat as it enters Lyvennet Beck. Above. Lyvennet Beck running in front of the hall and the church. Above. The modern ford through the beck. Above. Crosby Ravensworth Hall as it is today. The hall is now Grade II listed, and most likely contains material from the tower demolished in 1750. The Pickering family arms are mounted over the front door, but whether this is the original mentioned in 1550 is impossible to say. Above. Another view of the hall from across Lyvennet Beck. Above. Crosby Ravensworth Hall next to the church of St Lawrence. William de Threlkeld received permission to empark around 700 acres of land in the vicinity in 1336, and in 1350 built his pele tower here. The Threlkeld family married into the Pickering family in about 1550, and it was about this time that a hall was built up against the pele tower. The hall and its moat can be seen over the wall next to the road. There are stepping stones across Lyvennet beck and a narrow foot path running between beck and wall. Next door is the beautiful church of St Lawrence, no doubt well connected with the Threlked family and well worth a visit. It's been a while now since Lowther Castle opened its doors to the public. In 2010, the castle was leased to the Lowther Castle and Gardens Trust, secured funding for transforming the building and gardens, and in 2011 work started on consolidating the castle and dragging the gardens back to their former glory. Above. Lowther Castle as it appeared back in April 2007. Check out their website, Lowther Castle and their fantastic Facebook page for loads of information about the great work being done there, including the history of the site and visiting details. And of course.....another visit is due shortly so that I can take some more photos of the castle, especially now as the scaffolding has finally been removed. 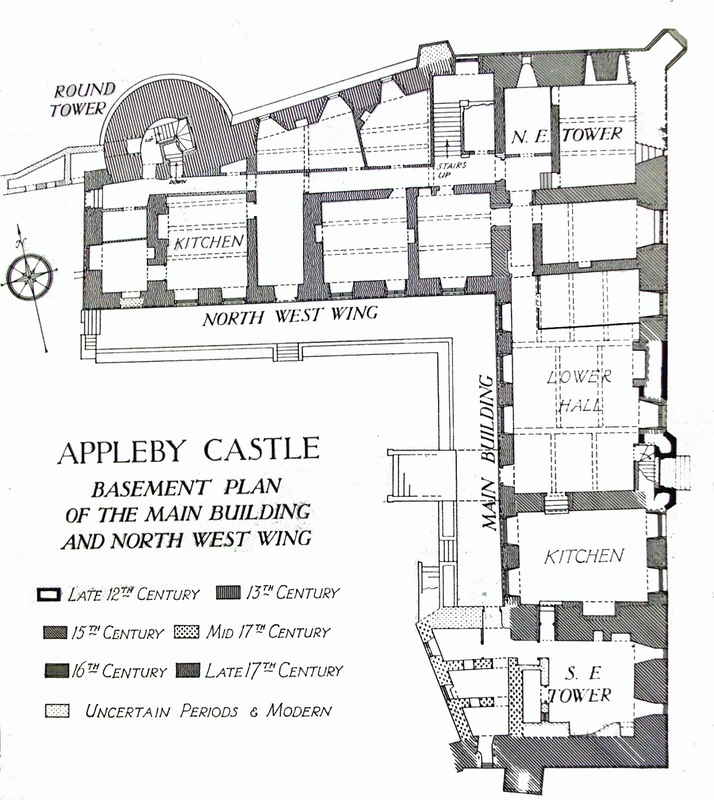 NEWS - Appleby Castle now open for tours. Closed for years due to a falling out with English Heritage, the owners seemed to have had a change of mind, and at long last, the only major castle in Cumbria I've not yet visited, is finally on my list for a visit. Photos and a write up to follow as soon as possible.